We now have some more information on what happened during the UK Uncut protest on Saturday so this is an update post to gather more of it together. I will save the commentary for now in favour of presenting the data I have gathered. Then some longer comments from @johnnylil, so I have strung them together for clarity. 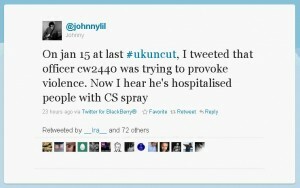 I stress that the above was on the 15th of January, and was the same officer that used CS spray on the 30th. Thanks to @Double_Karma for sending the above tweets to me. We also have some clarification from the lady whose arrest may have sparked this CS spray incident, left as a comment on F for Philistine. For the sake of convenience I have gathered several videos here. Video from @RoTreg It was sideways, so I have temporarily made a copy in the correct orientation until RoTreg gets a corrected copy online. Here’s the original. And a picture showing a delivery of milk by @seb_sears to Ben’s Cookies to replace that given for washing out the CS spray. 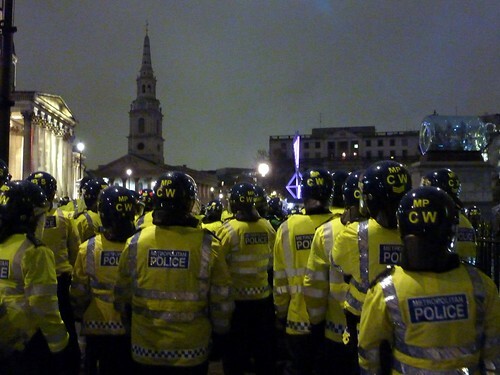 I have been sent a link to more photographs showing officer CW2440 being quite violent earlier in the demonstration. In yet another attack on our right to protest, police yesterday used incapacitant spray on peaceful protesters at Boots in Oxford Street, London. For an eyewitness account head over to F for Philistine where @dawnhfoster has written up what she saw, and includes some video. You can also read about events from @bc_tmh‘s point of view at Beyond Clicktivism. Since those two blogs have covered things much better than I could, I though that I would show you how events looked to those of us following them at home via Twitter. Reports for the first hour or two were of a successful protest, of people enjoying themselves, talking to people on the street and the police and shop staff being friendly but things went wrong just before 3pm. 15:27 @bengoldacre: When I went on #Ukuncut it was a really strikingly peaceful protest. Interested in justification for police pepperspraying ppl in face. The account was deleted a short time later, along with another Boots account. There is some speculation that the accounts were either fake or were run by Boots staff without authorisation. It did cross my mind earlier that the account might be fake, and on looking back through its tweets I found what looked like a genuine but very unprofessional twitter account. This video was taken in the immediate aftermath of the incident. Given that CS spray is supposed to be used just prior to restraining someone, and the victim must then be carefully monitored to ensure recovery, this video is fairly damning for the police. There was some confusion over what the police actually used on the protesters. Many people referred to Pepper Spray and others referred to CS Gas. What was used was actually CS Spray as confirmed in this Freedom Of Information request. [PDF] (A few police forces use PAVA spray instead.) A lot of people call it pepper spray even though it uses CS while pepper spray uses capsicum. CS spray contains the same active ingredient as CS gas, but dissolved in a solvent that can be sprayed instead of being a powder or being dispersed from a thermal grenade. CS Gas is actually banned for use in warfare according to the 1997 Chemical Weapons Convention. It might be illegal to us it on enemy soldiers, but it seems to be acceptable for the police to use it on civilians. When I tweeted this fact earlier, people seemed very worked up about it. As I write this, it has been retweeted 95 times! The guidelines are clear that CS spray is to be used only in defence to allow police to restrain someone who is a danger to others. From reading eye witness accounts it is obvious that the officer used the spray not to protect himself or others around him, but offensively when people did not do what he wanted. 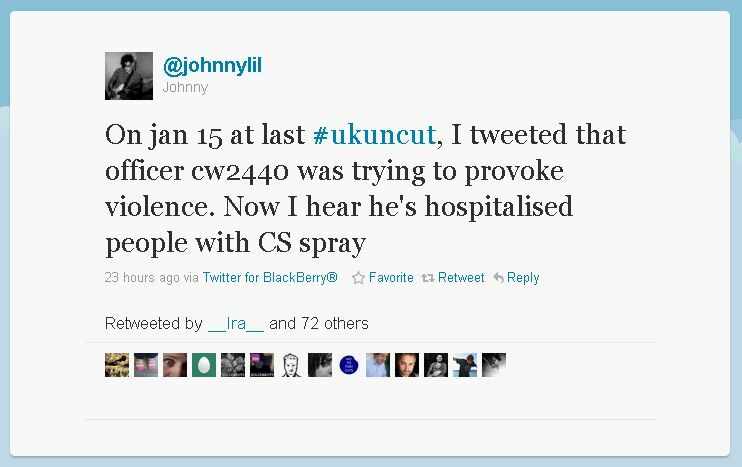 In 2000 the Police Complaints Authority carried out research in to how CS spray was being used by the police. They found that 38% of the time police were using the spray offensively, not defensively. I do not have any figures to know if this has changed ten years later but I would hope that it has. The guidelines state that “Tactical training in the use of the spray should emphasise precautions in relation to self / cross contamination.” Perhaps officer CW2440 hasn’t had that training, because not only did he incapacitate ten people and cause problems for several others nearby, he also managed to spray himself in the face. The guidelines also talk at length about caring for the incapacitated person after they have been sprayed and says this is of “utmost importance.” Details of recovery times are given and the guidelines state that particular attention must be given to monitoring breathing. They go on to say “A medical practitioner should examine those who cannot open their eyes or whose eyes are actively running beyond the normal recovery period. The expected period is 20 minutes after exposure.” In actual fact we can see from the tweets that it took nearly half an hour for an ambulance to arrive in a city where bikes and cars are used in addition to ambulances to make sure that paramedics get to the scene within 8 minutes and usually even less time. Questions should be asked about why it took so long for the ambulance to arrive. Protesters called the ambulance, did police interference cause the delay? The ACPO guidance also has this to say about the use of CS spray in situations like this. From what witnesses and those involved have said to me I think it likely that the use of CS spray was simply the actions of one officer that acted alone, when he saw protesters trying to bar his way to prevent an arrest of someone that had merely posted a flier through a door. Perhaps he panicked, or perhaps he was just itching for an excuse to exercise some power. Hopefully there will be an enquiry into this incident. More worryingly though, witnesses reported that police wearing a different uniform arrived on the scene shortly after the spraying, and those officers were carrying handguns. I can’t see any justification for sending armed police out to what had been a completely peaceful and friendly protest before the police got involved. The protesters that were arrested were drinking tea outside of Boots in Lewes. They were not preventing anyone from entering as far as I know, simply refusing to move away when ordered to. (Since writing this I have been told that people collecting prescriptions were all let through, others were discouraged but not stopped.) How the police issued their section 14 notice is not clear. The police officer in the video clearly used the line “You will be arrested in breach of conditions imposed under section 14 of the public order act. These officers will now arrest you.” Police action so far is legal, but as far as I am concerned it should not be in their power to order anyone to move in this situation. De-arrest means that no central record is ever made of the arrest, only that in the notebook of the officer concerned. Requests for statistics on de-arrests have been rejected because of this. De-arrest is necessary in some situations but the context in which it is usually used now is to force people to give their name and address to the arresting officer, clearly in breach of the intent of the law. There is no legal obligation to give identifying information to the police unless arrested, so the police have established a routine of threatening to arrest people unless they give information, and if that does not work then they arrest the person, take their details, then de-arrest them. This means that the police now know the identity of the person, but have no record of the arrest. Not only that, but the information that they have unethically seized is not stored as an official police record and so is not subject to the same controls. For an example of the sort of thing that the police do with the information, see this Guardian story about spotter cards used by the police at protests, and this comment by Mark Thomas on the same. “The information obtained under section 50 is subsequently recorded electronically and weeded after seven years. The fact that your details have been recorded in such a way does not constitute any form of formal police record, and would not be disclosed externally. 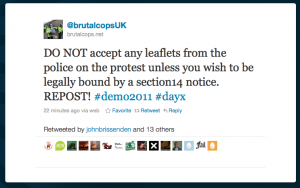 The police may be working within the law, but it is clear to me that that in the case of coercing protesters to give identity information and “de-arresting” they are abusing the intent of the law to keep records on people guilty of nothing except exercising their essential democratic right to protest, and in creating section 14 of the public order act MPs have given dangerous powers to the police that threaten our democracy. 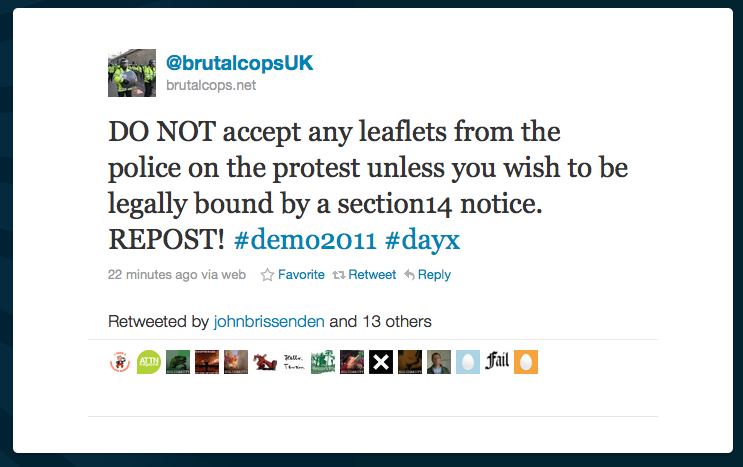 Advice seen this morning suggests that it would be a bad idea for protesters to take and read one of these leaflets because it will legally bind protesters to a section 14 notice. So what is this Section 14? Does a Section 14 or 12 notice have to be in writing? A Section 14 or notice only has to be in writing where it is issued in advance by the chief constable of police. It does not have to be in writing when it is issued at the time of the assembly by the most senior officer present. Can I be arrested if I have not been told about the conditions? It is an offence knowingly to fail to comply with one of the Section 12 or 14 conditions. So it would be a defence to say that you had no actual knowledge of the conditions – eg because you had not been told or, in the case of a notice issued by the chief constable, there was no written notice. The police sometimes use a megaphone to issue a Section 14 notice at the scene of an assembly, Activists arrested for breach of Section 14 are often subsequently acquitted because they simply could not hear what the police were saying and therefore had no knowledge that a Section 14 notice was in existence. T-pims are the new control orders. Or is that a drink? Apart from sounding like a drink, what else has changed? The answer is: not much. People subject to a T-Pim (It’s Pimms O’clock!) must stay in their house overnight for eight to ten hours instead of the previous sixteen. They will now be allowed to stay somewhere else as long as they ask permission. The restrictions will be limited to two years at a time. The suspect must still wear an electronic tracking device and will not be allowed to travel abroad. There is a little progress here but not enough. 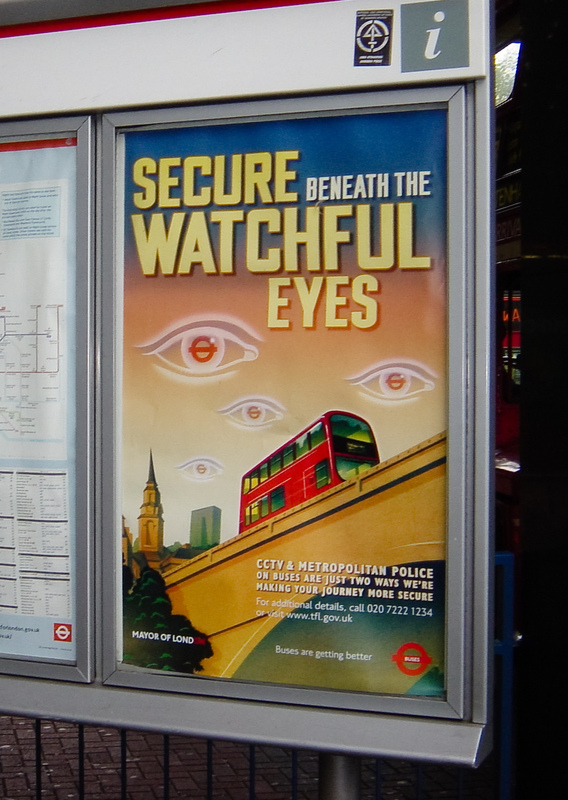 The government is still using fear as an excuse to keep a more authoritarian control of the people than it might otherwise get away with. The whole concept of a control order, where a person may have their freedom violated merely on a suspicion, is disgusting. It borders on creating thought crime and on abusing people based on who they associate with, two of the most vile concepts found in stories like Orwell’s 1984. It is fundamental to justice that the accused has a right to know the charges against them, so that they can defend against them. Ever since 11/09/2001 governments everywhere have adopted this tactic of power through fear of terrorism and we should not stand for it any more. Author LatentexistencePosted on 26th January 2011 26th January 2011 Categories PoliticsTags control orders, counter-terrorism, fear, pimms, politics, politics of fear, t-pims, terror2 Comments on T-pims are the new control orders. 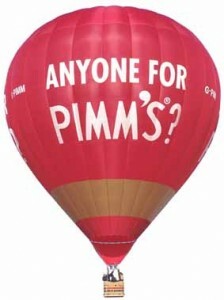 Or is that a drink? You may prefer to read a shorter version of this article. 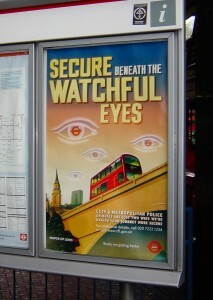 Author LatentexistencePosted on 24th January 2011 24th January 2011 Categories PoliticsTags control, oppression, police state, politics6 Comments on Do we live in a police state?